Top seed Roger Federer was beaten in the semi-finals of the Mercedes Cup by Austrian Dominic Thiem. 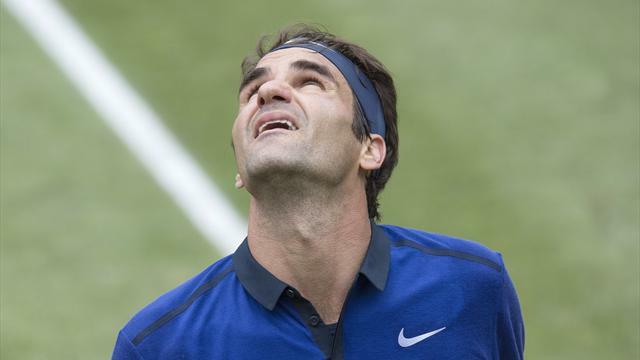 The Swiss world number three, whose quarter-final victory in Stuttgart saw him move to second place in the list of Open Era match wins, took the opening set, but after seeing two match-points saved, Federer was then edged out in the tie-break. Following a delay for rain, Thiem continued his recovery and after another stoppage by the weather, the world number seven went on to secure a memorable 3-6 7-6 (9-7) 6-4 triumph. Thiem had beaten Federer at the ATP World Tour Masters 1000 event in Rome last month, but admitted he was shocked by being able to reproduce the performance on the surface which the seven-time Wimbledon champion has proved so prolific. "I can't believe it. To beat Federer on grass is a dream," said Thiem, quoted on www.atpworldtour.com. "You need a little bit of luck to beat him on his best surface. I am the happiest person on the earth now." Thiem, 22, will meet either number seven Philipp Kohlschreiber or wild card Argentinian Juan Martin del Potro in Sunday's final.